An important and beautiful polish duo to show you today! 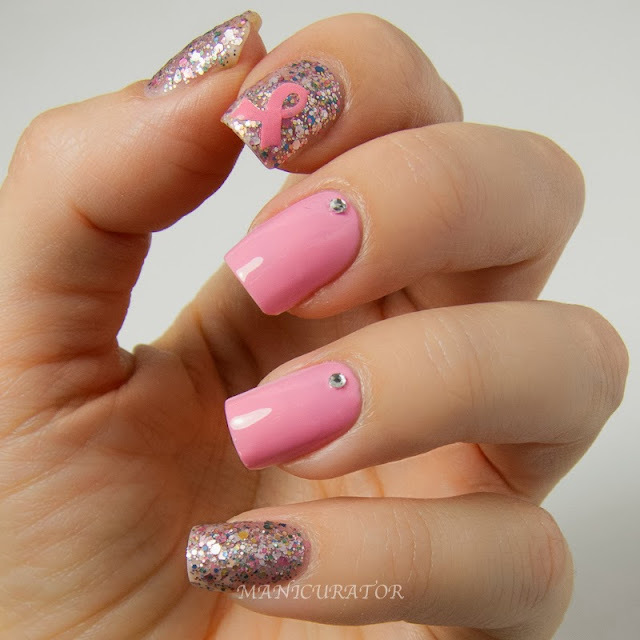 Proud to tell you about OPI supporting breast cancer awareness with their seventh annual Pink of Hearts promotion! Pink of Hearts 2013 includes two shades sold in one pack – the pale pink Pink-ing of You and the vibrant More than a Glimmer. This sparkly lacquer is packed with both micro and macro matte glitters in a rainbow of colors and should be worn without a top coat, either alone or layered on top of Pink-ing of You. 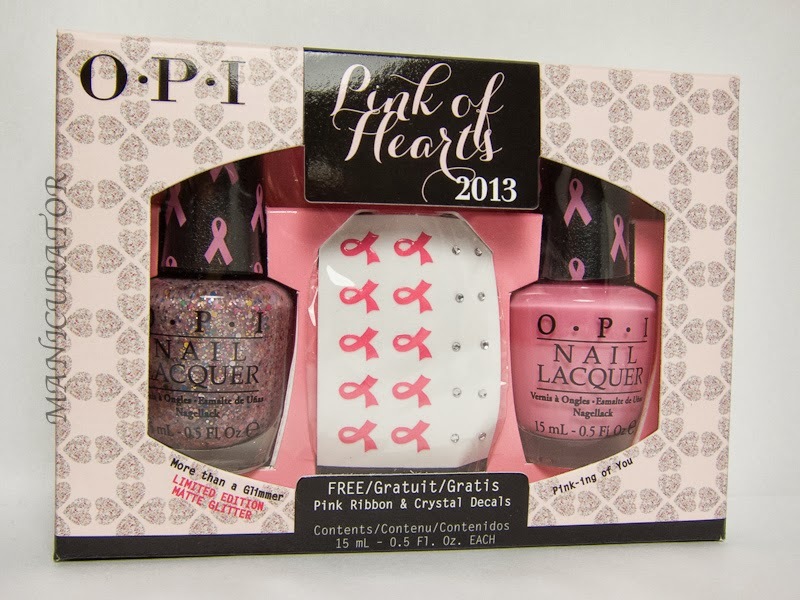 Each bottle also features a special pink ribbon cap wrap in support of breast cancer awareness, and every set offers 10 each decorative pink ribbon and crystal decals.This limited edition Pink of Hearts 2013 set will be available September and October 2013 at Professional Salons, including Beauty Brands, Beauty First, Chatters, Dillard’s, jcp Salons, Pure Beauty, Regis, Trade Secret, ULTA and ulta.com for $15.95 ($19.95 CAN) suggested retail. Can I start with saying I love this set? The pink is perfect. Happy baby pink with an excellent glossy creme formula. I have on three coats here, no top coat. The glitter is a fun combination, unlike anything I have already and love love that it dries to a matte finish. In my opinion it adds something special. I have on two coats here. You can easily imagine using one coat as a top coat but I wanted to see it on it's own. The crystals were super easy to apply, and I'm not skilled at it at all. I just picked up them up one at a time with a tweezer and placed on wet nail. The ribbon decal was just as easy to apply, I had no troubles. Very pretty! Glad to hear that the soft pink has a nice formula because sometimes shades like that can be a bit tricky! 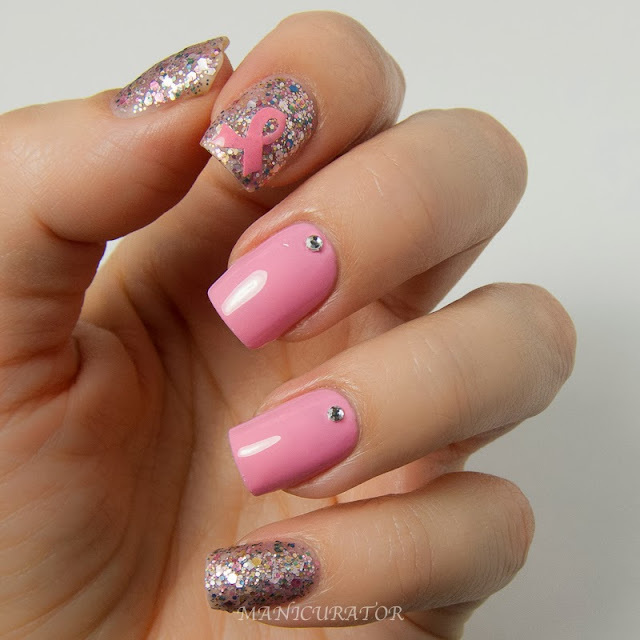 This is a lovely combo and mani; I don't think that I will be picking it up though because its so similar to a lot of my other pinks; how does it compare to last years pink? I know what you mean, this one is great though. Two thick coats or three thin and very easy to work with. The glitter reminds me a bit of Deborah Lippmann Candy Shop but less pink - very pretty!